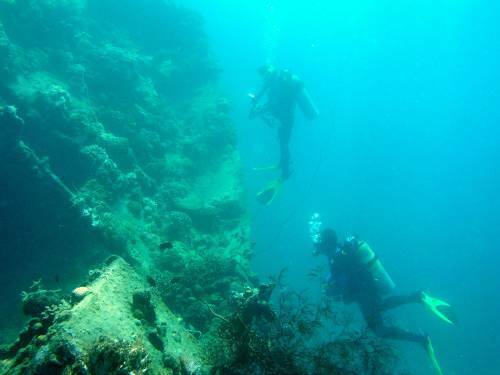 The IJNS Irako is one of the best shipwrecks in Coron Bay, one for experienced wreck divers only. A few minutes boat ride southwest of Kogyo Maru, another impressive Japanese Ship went down in this furious strike of the American Air force in September 24, 1944. The 145m long Irako, a provision-vessel for refrigerating food, sunk after disastrous bomb-hits mainly in her bridge-section and is now resting in a maximum depth of 42 meter of water in an upright position angled to her portside. For wreck-experts she is undoubted the best and most interesting wreck on the place. But, because of the depths and the size, sometimes unfavorable conditions and pretty advanced options to penetrate this wreck, it makes dives on this wreck some sort of serious. The good old Danish DM Claus Rassmunsen, one of the most experienced divers on the wrecks of Coron Bay, called a dive on Irako as a 'triple-d'-dive deep, dark, dangerous and he was absolutely right! Irako is definitely not a wreck for beginners. Advanced Open Water Certification with an experience of at least 25 dives, is the basic requirement, better to dive Irako with a wreck-specialty certification, because with a kind of confidence you can experience the beauty and the thrill of this gorgeous wreck much more! Transmission-room, the propeller-shaft on starboard-side, kitchen-compartments, a workstation with a lathe-machine left, the engine-room with the engines still in place are only a few highly exciting penetrations on Irako. But also for underwater naturalists there is a load to see: shoals of travelly, fusiliers and snappers, lion- and scorpion-fish, and you could be one to encounter a whale-shark the famous gentle giant! Irako was built in 1937 in preparation for the anticipated war with the United States. She was intended to supplement the Combined Fleet's existing food supply ship Mamiya. Her design was similar to that of Mamiya, but she was smaller. Her warehouse was able to supply for 25,000 men over two weeks. A sister ship, Kusumi, was planned in 1942 but construction was cancelled after the start of the Solomon Islands campaign. Irako had been underway from Japan to Taiwan today when she was damaged on 12 August 1944 by an unknown cause. Carrying a deck load of reconnaissance water planes she arrived in Coron Bay around 22 September 1944 and tried to hide her presence between Tangat and Lusong Island. In the morning of 24 September a number of fighter bombers of Airgroup 31 expended their bombs on the vessel. Already by their first strike they scored direct hits into the midship section. Set ablaze on the bridge superstructure Irako began to sink over the bow. However, it took some time before she finally went down with considerable casualties. Lying upright on the bottom her deck level is at 28 to 35 metres. Considered the best wreck dive in the Philippines the Irako is mostly intact, usually enjoys good visibility and has plenty of places to penetrate. Big groupers, schools of tuna and yellow fin, lion fish and scorpion fish live around this wreck. We were even lucky enough to spot a rare Shaded Batfish among the coral growth on the deck level toward the prow. There is a beautiful deep wreck penetration through the engine room for trained, experienced and properly equipped wreck divers. Irako usually has the best visibility of all the wrecks in Coron Bay.